Cricklade Fritillaries - A natural history spectacular not to be missed. Update 11 April 2019 - Fantastic displays especially on the north of the reserve. Want to know where and when to see Snakeshead fritillaries? Once a year around mid April, North Meadow, (just 0.5 miles from Cricklade town centre) is turned into a blaze of colour by fritillaries blooming on this ancient meadow. 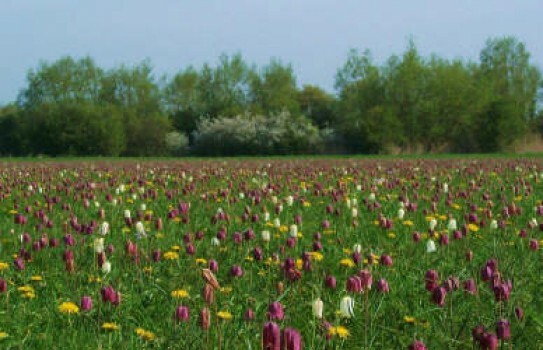 Around 80% of Britain's snakeshead fritillaries grow here. Once the fritillaries are over, cowslips come into flower and then, in June, the meadows burst into colour again with hay meadow flowers including greater burnet, common knapweed, ox-eye daisies, meadow rue and meadow sweet. Well worth travelling to see the spectacular display of fritillaries. Not just a small field - a walk around them takes around 1 hour. 2019 - North Meadow fritillaries - Cricklade - open all year. Go north through Cricklade Town and meadow is on left after around 0.5 mile, park on side of road. Click on web link for up to date details. Flowering normally around mid April.